A gauss meter displays electromagnetic wave measurements in Gauss (G), milliGauss (mG), milliTesla (mT) or microTesla (µT) units. A gauss meter can detect either static (DC) permanent (rare-earth) magnetic or dynamic (AC) electromagnetic fields (EMFs), or both. Thus, it is important to review the specifications of a gauss meter prior to purchase to ensure suitability for the intended application. Neodymium (NdFeB) permanent magnets are among the world's strongest and most widely used magnets. When testing magnets made of neodymium or other rare-earth elements, a gaussmeter or magnetometer capable of measuring DC magnetic fields is required. However, most electromagnetic fields encountered are generated by AC currents. Examples include electrical power lines, transformers and wiring for overhead lighting, solar panels and other electrical devices and equipment. Electromagnetic fields from electrical installations are believed to cause feelings of nervousness, anxiety and paranoia in EMF-sensitive human beings. 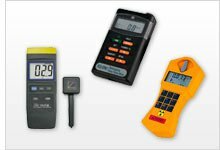 Most gaussmeters offered by PCE Instruments can be calibrated and certified according to DIN ISO 9000 standards for an additional fee. Replacement gaussmeter probes and optional accessories are available for most gaussmeter models. PCE-EMF 823 is a portable handheld single-axis Gauss meter or electromagnetic radiation detector for measuring electromagnetic fields (EMFs). This user-friendly EMF meter is ideal for assessing risks associated with exposure to electromagnetic radiation emitted from electric power lines, home appliances and industrial devices. PCE-G28 is a portable, handheld gauss meter that detects electromagnetic fields (EMFs) and displays measurement results in milliGauss (mG) or microTesla (µT). This EMF radiation detector comes with an external 3-axis electromagnetic sensor (X, Y, Z direction). PCE-MFM 3000 is a handheld gauss meter that detects both static (DC) permanent magnet (rare earth) magnetic and dynamic (AC) electromagnetic fields (EMFs) and displays measurement results in gauss (G) or milli Tesla (mT). This portable magnetic field measuring device comes with an external sensor and features an RS-232 port for downloading data to a PC.